Back in April when my friend Lauren visited, we went on a tour of the Tower of London. It was quite sad because she knew way more about English history than Luke and I. It was all because she had watched the television show, The Tudors, which goes through the life and wives of Henry VIII and how important his reign was to present day England. Luke and I decided to watch the whole series, and although at times we wanted some characters to "beheading" off the show, we enjoyed learning about some extremely important historical events in England. So, I am writing all of this because Luke and I visited Hampton Court Palace all because it was one of Henry VIII's masterpieces. The Palace was initially built for Cardinal Thomas Wolesley, but when he received the traitor sentence, King Henry took full ownership. The King expanded the palace quite a bit during his reign creating a massive kitchen, court, and several apartments. It sits right on the River Thames, so back in the day, many arrived and departed by boat - and it is still possible to do this today. It was a nice day outside, so Luke and I were excited to spend some time in the sun in the palace's lovely garden. Little did we know that the palace is massive, and we spent three hours just inside the castle! By the time we finished touring the castle, we were pretty tired from being on our feet for so long. Since we were visiting on a Sunday, the chapel was closed at certain times - we missed visiting by literally one minute. Oh well. Hampton Court Palace eventually fell into the hands of King William III, who expanded the palace even more. Luke and I didn't give much care to King William's area because we were pretty much done with the palace by that time, and we wanted to enjoy the sun. Finally, we got out in the sun and walked in the gardens for a bit. 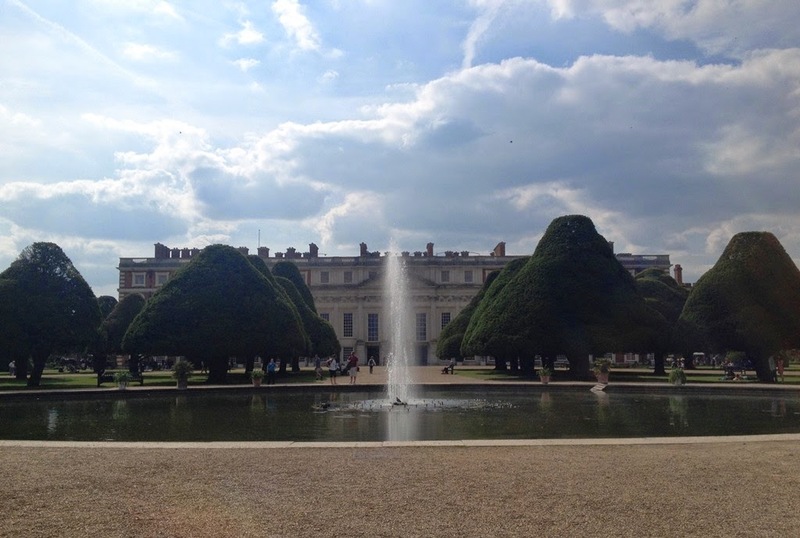 There are a few special aspects to Hampton Court Palace's gardens. The first in the Grape Vine, which is said to be the largest in the world. One massive vine wrapped all around the ceiling/roof of a greenhouse. It was really difficult to take a picture. The second neat thing in the gardens was the maze. We have visited several cities that have mazes, but Luke and I have never actually done one. When we got in, we sorta regretted the decision to attempt it, but it was part of our ticket, so no money goes to waste! We passed the same people over and over again and went down the same pathways over and over again. Eventually a group of us followed one another to the center which happened to be where the exit was. We win! The last British monarch to reside in the palace was George II (ruled 1760-1801). NOTE: When Luke and I first moved to London, we stayed in a hotel directly across from the palace, but we had no clue it was there. We totally should have taken advantage of jogging in those beautiful gardens!